Mai’s Palestinian Dinner. The story of a lucky raffle ticket won by Marilyn and Ed Thompson at the 2017 Seraj Benefit. Arriving at Marilyn and Ed Thompson’s home one recent April evening in my role as chef’s assistant, Mai Khader Kakish, Palestinian chef, blogger and food stylist extraordinaire was already moving briskly around the kitchen, unpacking wonderful things from the colorful bags and coolers she had brought with her and starting to set up prep areas for the Palestinian Feast we were about to prepare and serve to the Thompsons and their four guests. Out came perfect vegetables; eggplants, white and red radishes, baby carrots, endives, tomatoes...a whole head of cauliflower. 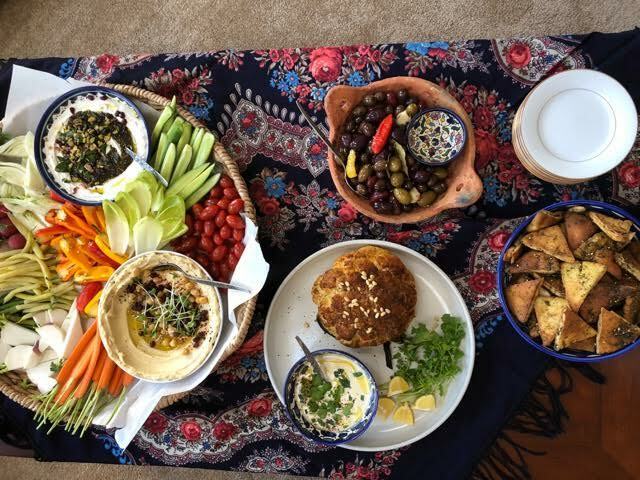 There were red and orange peppers, spices, dried fruits, nuts, pomegranate molasses, Palestinian olive oil, Tahini, home-made hummus, and much more. She had brought a veritable pantry of ingredients with which to create the many dishes we were about to make. I am good at chopping so I was put to work washing, cutting and chopping vegetables for the dishes to be served on Mezze table while Mai busied herself with warming her special marinated olives in the oven and smearing the whole cauliflower head with a spicy paste before sliding it into the oven to roast. In Palestine most festive meals are leisurely affairs full of conversation and stories. They usually begin with a Mezze table, almost a meal in itself, that is a feast for the eyes and the palate. It offers guests lots of small tastes of a variety of foods and beverages as they chat and get to know one another or catch up on the day. Vegetables in all their variety were the stars of our Mezze table along with the olives and various sauces and dips. These were accompanied by charred pita bread and Zaatar chips. 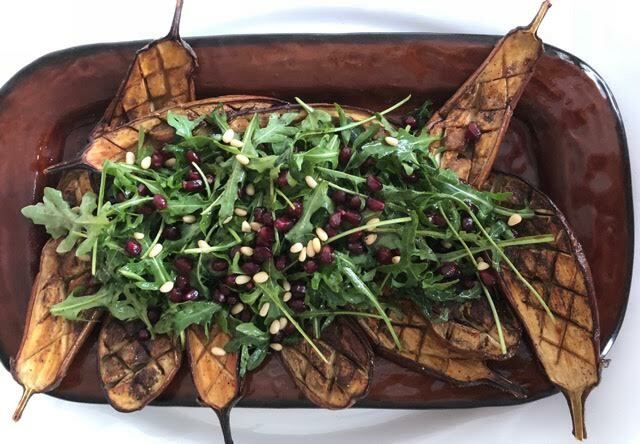 Once the Mezze was laid out and guests invited to sit down, we got busy with finishing the main courses back in the kitchen. 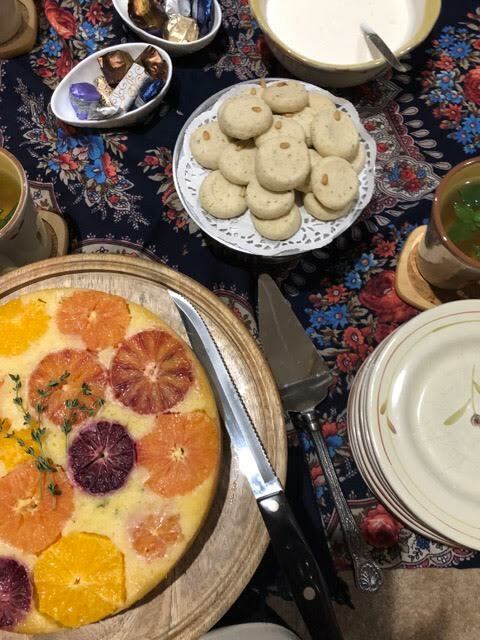 Later the Mezze table was transformed into a Dessert table featuring a Citrus, Thyme and Olive Oil Cake and Ghraibeh shortbread cookies. 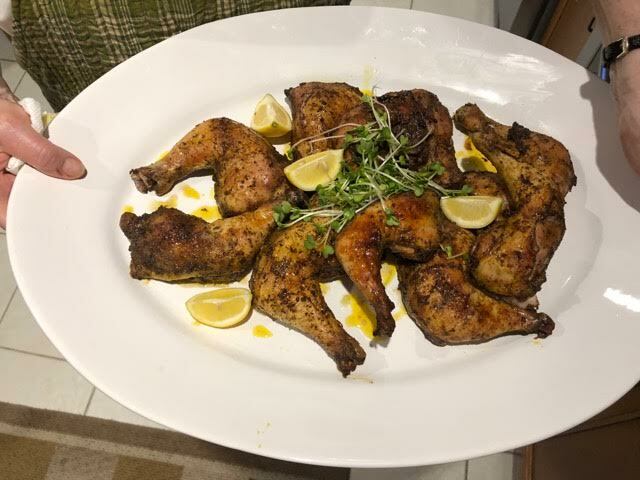 Guests were invited back to the living room for dessert and their choice of fresh mint tea and coffee while the chef and assistant chef cleared up the table and the kitchen. Photos above: Mezze table. 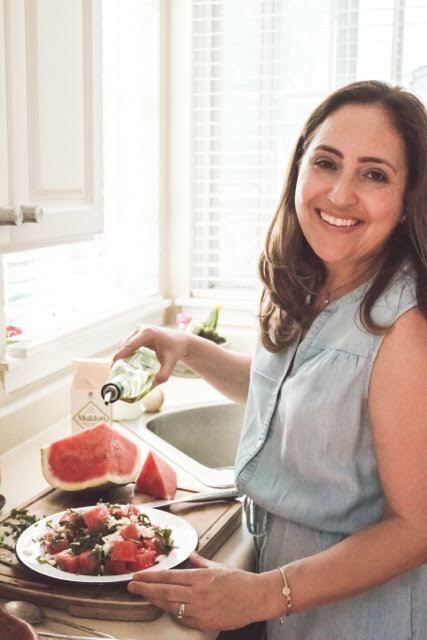 Below, clockwise from the top: Mai in her kitchen, Dessert table, Roasted 7-spice Chicken, and Roasted Eggplant Steaks with Pomegranate Molasses. Not shown: Yogurt, Cucumber and Mint Sauce, Palestinian Falahe or “village” chopped salad, and Green Wheat Pilaf (Freekeh) with nuts and dried fruits. Article by Diane Fite, Seraj volunteer. Look for another Palestinian Dinner opportunity at this years Benefit, October 14. Two New Libraries, in Two Years. Help us get ready for our next fiscal year, which begins July 1. Donations to Seraj have been especially strong in this past year. Thank You! We have received in excess of $150,000 since last July 1, 2017 (a record high amount, from 259 donors). Tubas. Our 2018 library will be in Tubas, which will be part of a cluster with the Jiftlek library, as they are only about 30 minutes apart from one another. Tubas is home to around 17,000, so it will be the largest community with whom we work. We were approached by the village council and it's very active mayor. The village council currently houses a library, which consists of a couple shelves with a few books and two tables. They had heard about Seraj and visited our website, then sent us a proposal and requested a visit from us. We were very impressed with their enthusiasm and willingness to contribute to the project's success. The town currently has a librarian on staff, which will help to support the library with regular opening hours and activities after we establish it. They would like to establish a library for all ages, and are particularly interested in activities for young adults/university students. 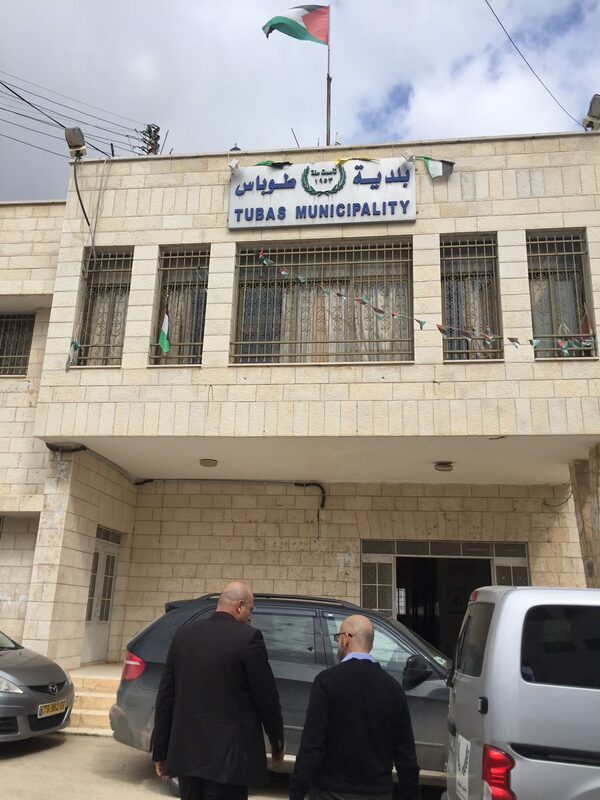 Although it is a large town, Tubas is surrounded by settlements, making it difficult for residents to travel easily to and from other areas of Palestine. They will benefit greatly from an active and thriving library, and we look forward to partnering with this active village council. Abu Falah is a village of 6,500 people north of Ramallah. If we keep moving forward in this partnership and establish a library there, it will be the third library in the cluster of Al-Mizra Al-Sharqiyyeh and Taybeh. We are particularly excited about this location as the partner organization, the youth club, is like-minded. During our first meeting with them, the president of the youth club said “it’s easy to get funding for roads and buildings but they won’t last, we want to invest in the character and minds of our youth.” Hooray! We have big hopes for this cooperation, and they have already said they want to have competitions between their library and the others in their cluster. Before anything else, we look for partners with the right attitude, and we think we have them here. We would like to finish this library in the second half of 2019. Seraj US has funds in place to complete the first library, Tubas. But we need to get a head start on Abu Falah. As we come to the close of our fiscal year (June 30), we are asking for your support. Additional gifts will allow us to follow through on our commitment to libraries # 9 and # 10. Presentations by Estephan Salameh, Seraj co-founder from Jerusalem, and Yazan Meqbil, a remarkable Palestinian college senior in Indiana. For More Benefit Details and Tickets, click here.